Cuts to foreign aid won’t make it according to Senator Graham. 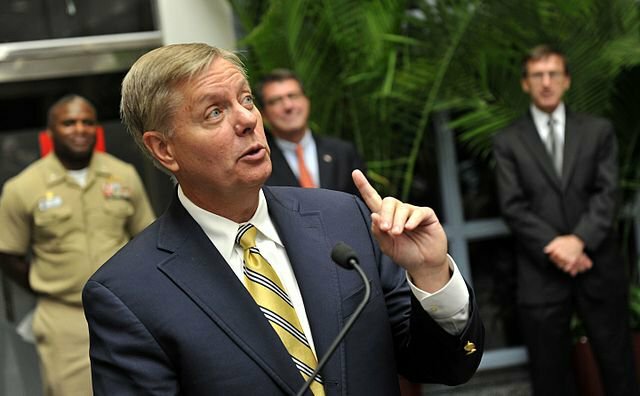 Lindsey Graham, Republican Senator from South Carolina, just called US President Donald Trump’s budget plan “dead on arrival,” an early sign that the upcoming budget negotiations will be fiercely contested. Trump is proposing cuts to the State Department budget, and for anyone fearing how this would affect foreign aid programs, Sen. Graham shared some powerful words on Tuesday..
Graham has been one of few Republicans leaders consistently critical of Trump’s policies while others remain silent in both political parties. He and John McCain (R-AZ) issued a joint statement opposing Trump’s travel ban on seven Muslim-majority countries in January. “This executive order sends a signal, intended or not, that America does not want Muslims coming into our country. That is why we fear this executive order may do more to help terrorist recruitment than improve our security,” read the statement. This time, Graham’s opposition to Trump’s budget proposal comes just ahead of Trump’s address to Congress on Tuesday, Feb. 28, at 9 p.m. ET, and just weeks before Trump formally presents the budget proposal to Congress in mid-March or early April. Former presidential candidate Sen. Marco Rubio echoed Graham's statement in a tweet. So far, the outline for Trump’s budget proposal includes boosting military spending by $54 billion and making cuts elsewhere, including the Environmental Protection Agency and the State Department, which handles foreign aid, according to reports Monday. Foreign aid is already one of the smallest portions of the US federal government’s budget, at just 1%. “A cut this steep almost certainly means cuts to agencies that protect consumers from Wall Street excess and protect clean air and water,” said Senator Chuck Schumer (D-NY). As Schumer and Graham show, the budget will face resistance in Congress, which gets the final say in what the country spends money on. Trump has mocked and ignored Democrat representatives who’ve spoken out against his policies, so a message from a senator of the House majority party, and Trump’s own party, could hold more sway in the fight to save foreign aid.